Heavy winds this morning blew down several vacant rowhouses in West Baltimore, including two across the street from an elementary school and one two blocks from the spot where Freddie Gray was arrested. Passersby this afternoon gaped at 1625 North Payson Street, a rowhouse whose roof and walls at the top appeared to have been ripped away, like a raggedly shorn-off cereal box. “I walked by here yesterday. I stood right in that spot,” said Kelly Curney, pointing to the side of buildings, where brick, wood and other debris had fallen in a heap and scattered across the sidewalk. Curney had good reason to be counting her blessings. 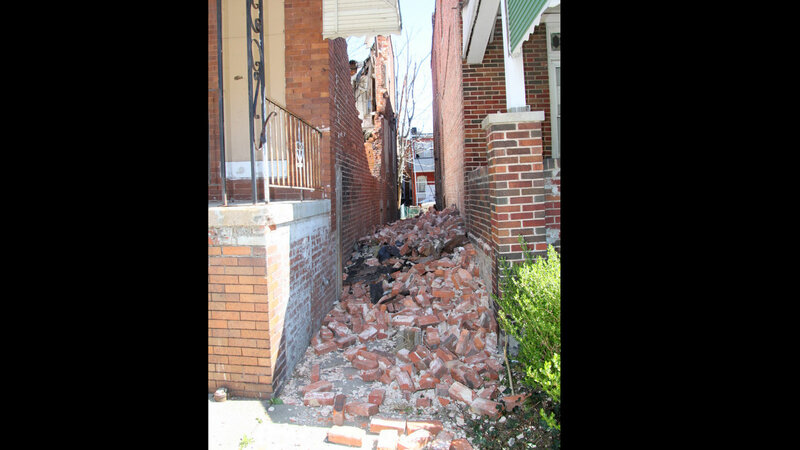 She had read about the death of retiree Thomas Lemmon after a vacant rowhouse in the 900 block of North Payson Street collapsed on him Monday. “You know a man got killed just sitting in his car,” said Curney, pointing toward the spot, just a few blocks up Payson, where the incident occurred. Winds gusting to 60 miles an hour were bringing down trees branches and prompting authorities to issue wind warnings for area bridges. 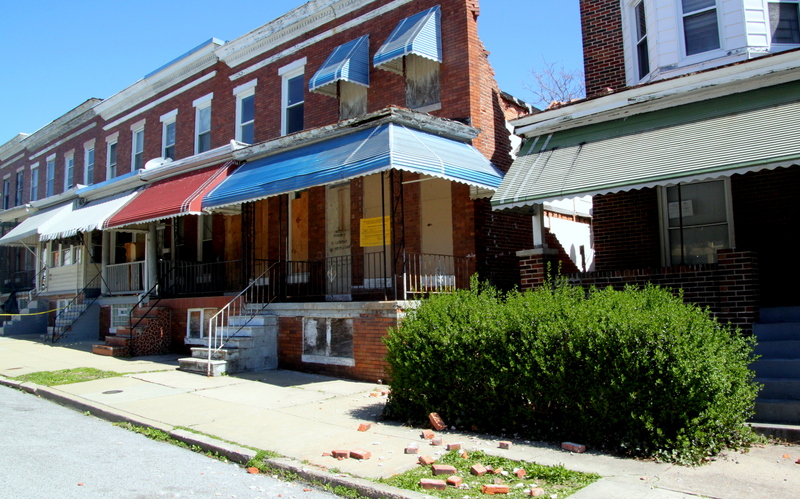 In Baltimore, the heavy winds were taking vacants down patricularly in West Baltimore. 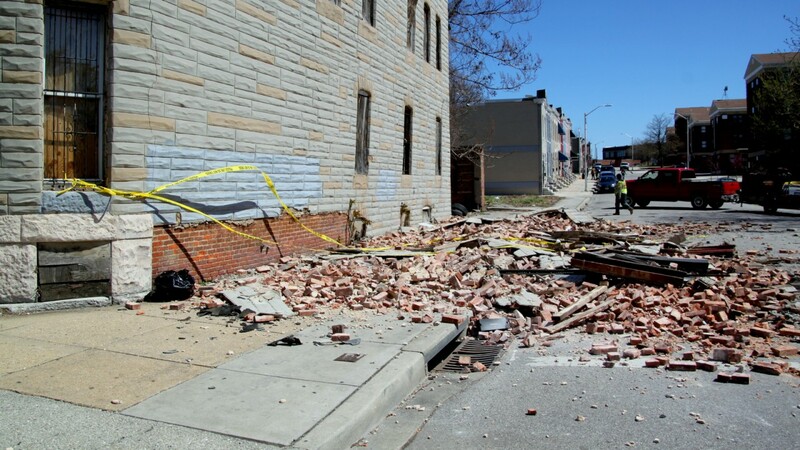 In addition to the houses on North Payson, another rowhouse collapsed nearby at 1701 North Fulton Avenue, at the intersection with Presbury Street. There were also reports of a collapsed building at Mosher and Vinson Street and another near North Fremont and Riggs Street that damaged several cars. Residents in the 1600 block of North Payson, a mix of occupied homes and vacants, are pretty sure they know when the buildings on their street blew down. “It was about 2:30 or 3 in the morning. We had a jolt of wind that actually shook the house like a hurricane. That must be when it happened,” said Michael Johnson, 74. “My walls went like this,” he said, wiggling his body. Marvin L. “Doc” Cheatham, president of the Matthew A. Henson Neighborhood Association, said by daybreak he began getting calls from the neighbors about the collapse. 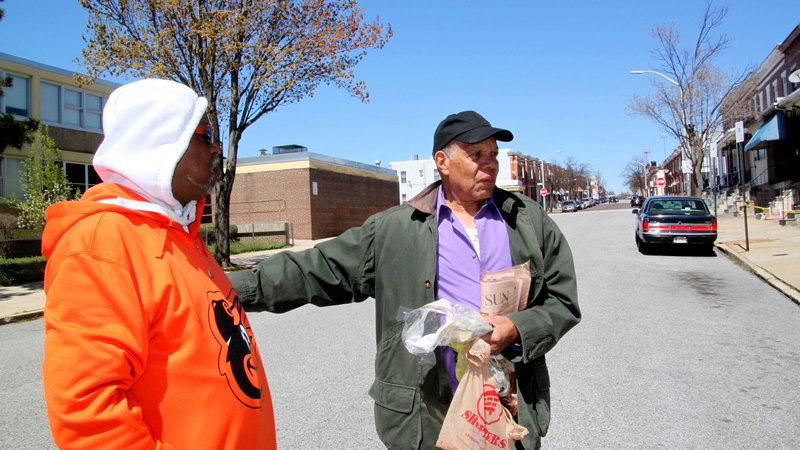 One of their main concerns: that Matthew Henson Elementary School is right across the street. He pointed out a part of one of the buildings that looks like it is still unsafe. In the nearby collapse at 1701 North Fulton, it was also the roof that collapsed. 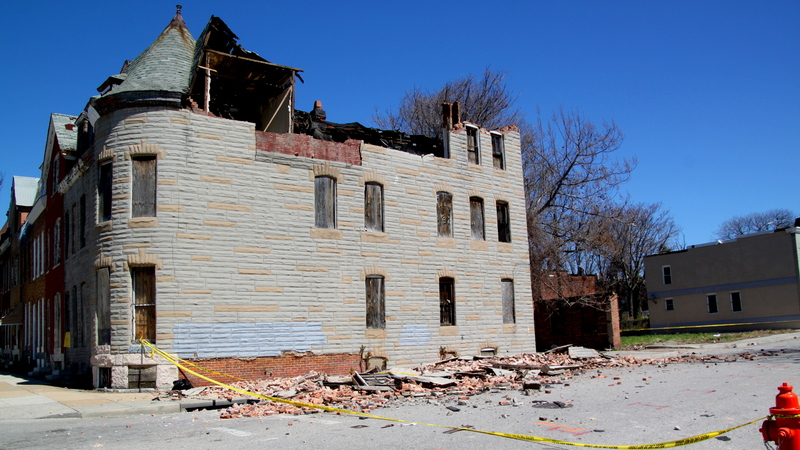 Later in the day, crews hired by the city could already be seen taking the entire dilapidated structure down. It stood right across from a mural made to remember Gray, who died last April after his arrest by police just a few blocks away on Presbury. “The Power of the People,” it reads.